Chemical/Electrical/Mechanical Cadre. Required qualifications and willing candidates may submit their application form online for this IOCL Gujarat Trade and Technician Apprentices jobs on or before 08-03-2019. 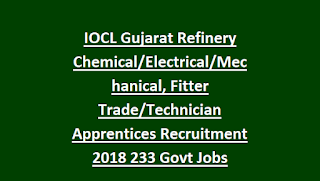 There are total 62 Chemical/Electrical/Mechanical Trade and Technician Apprentices vacancies available in this IOCL Gujarat Refinery recruitment. Selection process for this IOCL Gujarat refinery Trade/Technician apprentices will be held through written test and personal interview. 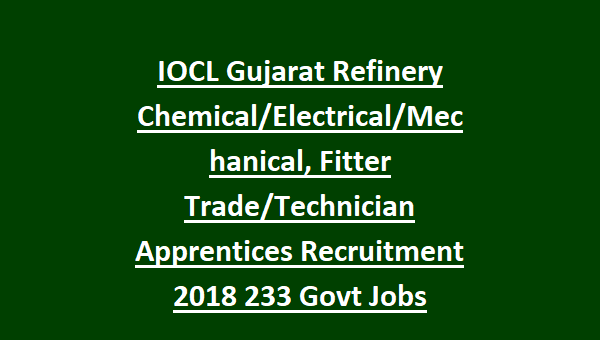 Educational qualifications, Age limits, Written test pattern and more details are given below for Trade/Technician Chemical/Electrical/Mechanical Apprentice Recruitment of IOCL Gujarat . Result of the written test will be published on 29-03-2019. There are 62 vacancies available in IOCL Refinery of Gujarat. As on 28-02-2019 candidates age limit is 18 to 24 years. 5 years upper age relaxation for SC/ST and 3 years of OBC candidates. For Technical Apprentices- The candidates should have completed 3 years diploma course in Electrical/Mechanical/Instrumentation/Refinery & Petro Chemical Engineering qualification required in full time, regular/sandwich. Engagement of IOCL Trade/Technician Apprentices recruitment will be held based on written test and personal interview. Written interview is carry for 85% of marks and interview for 84%. For trade apprentice Chemical Plant Attendant Operator Training period is-18 months and for technician apprentices 12 months. Applications will be received online through official website of IOCL Gujarat @ http://www.iocrefrecruit.in/ from 16-02-2019 to 08-03-2019. After submission of application form take printout and attach all required documents and kept yourself. At the time of attending the interview bring the Application form along with all required documents. Please share this IOCL Gujarat/Panipat recruitment those who are really looking of these vacancies. Cadre. Qualified candidates can apply online for this IOCL Paradip jobs on or before 08-03-2019. There are total Chemical Apprentices vacancies available in this IOCL Paradip Refinery current recruitment.. For more details see the details given below for Trade/Technician Chemical Apprentice Recruitment of IOCL Paradip. There is 15 vacancies in IOCL Refinery of Paradip. As on 28-02-2019 candidates lower age limit is 18 years and maximum is 24 years. These vacancies are reserved for SC/ST candidates. For Technical Apprentices the candidates 3 years diploma course qualification required in full time, regular/sandwich. For Trade Apprentice monthly stipend is Rs.6970/- first year and Rs.7220/- second year. Engagement of IOCL Apprentices recruitment will be held based on written test and personal interview. Written interview is carry for 85% of marks and interview for 15%. For trade apprentice-18 months and for technician apprentices 12 months training period. Please share this IOCL Paradip recruitment those who are really looking of these vacancies.